Sorry for the partial picture. I lost track of the picture I had of the bag before opening and had to crop a shot of it from among a bunch of other things I bought. I'm sure it makes a huge difference. I think it's important to say that the title of this post is not my translation of this item. It is the one that is written on the package. It's proof that crummy translation is done even when a big corporation is behind it, in this case, Daiso Japan, and has the resources to do better. I had the feeling that someone plugged the Japanese into Google translate and dutifully just wrote down the first thing that came up. I bought these not because they have a funky translation, but because they are kinako (toasted soybean flour). It's not wrong to say that going to the Daiso Japan approximately 4 months after leaving Tokyo brings actual tears of nostalgia to my eyes. It's almost like stepping back into a Daiso back home in Asagaya, except that this one has a lot more cheap, tacky figurines than that one and sells food. My local one never offered any snacks as the one in Mountain View, CA does (and I thank it wholeheartedly for that). I paid $1.50 ($1.91) for these at that shop. In Japan, I was a fan of pretty much all things kinako and this was the only food item that featured that nutty dusting of food goodness that I came to enjoy. Unfortunately, upon opening the bag, my affections immediately began to waver. It was like falling in love from a photo and finding that the minute the object of my admiration opened his mouth, he had bad breath. The contents smell very funky, like weird organically produced and fully sustainable glue products. Though scent is not the only important thing, it tends to tell you something about the taste. Though I was not encouraged, I popped one of the pea-sized morsels into my mouth. From external appearances, I wasn't sure if the texture was going to be hard or soft or chewy or crunchy. They look like little sugar-covered hard candies. The true texture is that of an extremely dense ball of Play Dough, or at least what I think it would be like. I never actually ate my toys as a child, though I do know that some kids did nosh on their colorful balls of putty. The flavor is not particularly strong. It does taste like kinako to some extent, but there's a weird aftertaste and the flavor doesn't feel like it is punched up enough. It tastes like bland flour with just a hint of sweetness. This is rather surprising since the ingredients are soybean flour, sugar, starch syrup, sesame, oligosaccharide and salt. That's a lot of sugars for a relatively bland flavor hit. It does all translate into a lot of calories though. If you are so hungry and desperate that you'll eat the entire 110-gram (3.88 oz.) bag at once, it'll set you back 385 calories. I didn't count the total number of tiny dumplings, but I'm guessing each one is between 10-15 calories. Chances are, you'll never get past 50 calories at one sitting as these are far from "more-ish". The company that makes these, Takadaya Kinako, recommends that you "gently warm" them in the microwave. I threw three dumplings in the microwave for 12 seconds and, though they did not get particularly hot, they smelled like they were burning. Even though the temperature was such that there was no risk at all of scorching my mouth when I popped one in, one of them still tasted slightly burnt. While warming them did improve the texture slightly, it really wasn't that much better and it had a negative impact on the taste. These are not good, really. 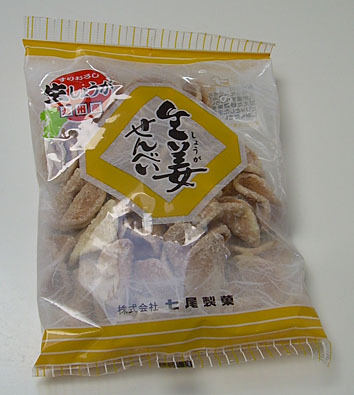 I'm probably going to slowly eat the whole bag over a prolonged period of time because I love kinako so much that I'll consume them out of nostalgia for that particular flavor, but they really need something more than they've got both in terms of texture and flavor. My guess is that they could have used more salt, but even possibly more sugar, or some medical marijuana... something to make the experience of eating them more joyful. This is marketed mainly as a healthy candy and the company says you can give this to your children and not feel bad about it. They mention oleic and linoleic acid as well as various vitamins and minerals, fiber, and protein. I'll grant that it may indeed be healthy, but I'd argue with the notion that it in any way resembles candy. If you're looking to substitute something uniquely Japanese for a protein bar or energy bar, this might be your snack. It's got a real similar feel to it as a Lara bar or Clif bar in that it is a doughy clump of protein-based stuff. If you're looking to entertain your taste buds, I'd suggest heading off to more flavorful pastures. I'm on the fence about how I feel about fast food places incorporating what appear to be higher class ingredients into their offerings. On the one hand, it's kind of nice that they want to mix things up a bit. On the other, they almost always dumb things down in such a way that they're not really all that one might expect. I've read far too many reviews of sauces which are little more than mayonnaise mixed with some core ingredient to simulate an international flavor without straying too far from what a pedestrian palate will tolerate. We want our fast food to be only marginally more interesting than what we're used to because nobody goes to McDonald's for adventurous cuisine, not even the Japanese, who generally will tolerate a wider flavor range than the average American. All images from the McDonald's Japan web site. A beef patty on ciabatta bread (which is Italian, not French, right?) with mozzarella cheese (again, Italian), gravy, butter sauce, lettuce and tomato. 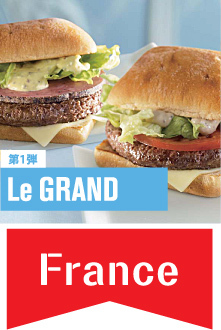 This burger seems slightly more on the international side, or at least it suffers from a bit of a nationality identity crisis. A beef patty on ciabatta bread with mozzarella, mustard sauce, and sausage (German?) with the requisite lettuce and tomato. These sandwiches are currently available and were introduced on July 18. A bun topped with cornmeal houses a crispy chicken patty with tomato, lettuce, onion, cheese, and a spicy curry sauce. Aussie beef pastrami on a bun that has been steamed to plump it up. Yellow mustard, possibly with stone ground seeds, is added to boost the flavor profile. Any time that an international version of any food is introduced, it's a reflection of a foreign country's perception of another country's cuisine as well as their own tastes. In America, anything labeled "French" which is not a fry would be served on a croissant or a baguette. In Japan, I'm guessing ciabatta bread is the closest they can come to something which isn't a regular burger bun which is easy to store and handle (and cheap to produce). The inclusion of sausage and mozzarella cheese on the French sandwich mystifies me, but I am a dumb American with little exposure to true French cuisine. It's all butter, long loaves of crusty goodness, cold potato soup, and pastries to me. For all I know, mozzarella is the national cheese of France (though I would've expected it to be brie) and they are sausage sucking fiends (read into that what you like). 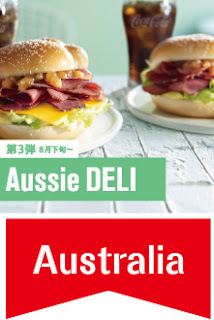 The Australian option reminds me of Arby's, except without the American beef option. As I've mentioned before, the whole mad cow scare was amplified to the point where the dial was definitely at "11" in Japan so the local consumers don't feel comfortable with cows that were born in the U.S.A. The Fukushima situation has them none too thrilled with the idea of native beef, but they have strong confidence in not being somehow poisoned by cows that like to add a "y" to the end of most of their words (choccy, prezzy, grundies, etc.). 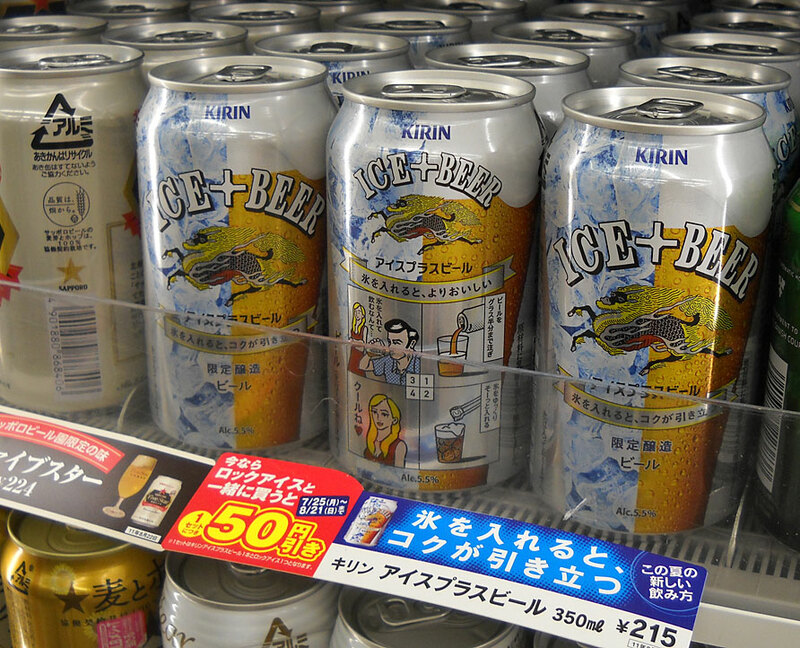 Last year, when energy conservation measures were first implemented to help compensate for losing nuclear power, Kirin introduced beer that you could put ice in. My husband wanted to try it, but never got around to it and it vanished from the mark. As a teetotaler (a status which amused some of my students, especially a few of the men, to no end), I'm not really sure why beer shouldn't have ice in it. I figured it smells horrible no matter what you do with it and you couldn't water it down enough to make me want to drink it. 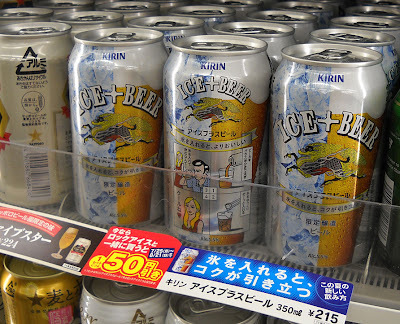 All I can say is that it must have been a fairly decent product for Kirin since it's back again this summer. If any beer drinkers out there would like to leave a comment and let me know why ice doesn't go in beer, I'd love to understand. You don't have to dress strangely to drink Pepsi Black, but apparently it helps. I didn't go out of my way to procure a bottle of Pepsi Black for review, but Marvo the marvelous over at the Impulsive Buy did. I won't spoil the surprise and will simply allow you to click on over there and see for yourself whether or not I should be filled with remorse and regret at not having purchased my own over-priced imported bottle. If you have forgotten what the deal is with Pepsi Black, I wrote a bit about it here. Modern life is fraught with choice. In fact, I've read that psychologists have done studies in which too much choice causes stress and people need to tune out a lot of the options in modern stores because it is overwhelming to them. In Japan, there were often items in the snack sections that my eyes pretty much slid past. I saw them, but there were so many choices and I knew that I couldn't try them all so some were left behind. As the time of my planned departure drew near, I started noticing all of the things, especially in the traditional/granny's snacks areas, that I had never gotten around to reviewing. I regretted that I couldn't get to them all, but I also know that there are vast swathes of food that I never ate back home either. Next time you're in a market, take a close look at what you reject out of hand everyday because it falls outside of your regular consumption. You may be surprised at how many items you've never put in your shopping basket because they didn't light your fire compared to other items of a similar nature. We tend to form chains of preferences rather than to step far beyond our circle of likes. Part of what people who review food do for you is tell you about products such that you might feel compelled to take notice and buy outside the box, or confirm that you probably would like to make sure that a certain item never gets into your box. I saw a lot of these little crackers/cookies. They look like the mutant offspring of a fortune cookie and a frosted flake. Part of what made me dismiss them in Japan was that I had been mislead by streaky white stuff on sembei before which looked sweet, but was just coatings of weirdness. However, during my feeding frenzy at the Daiso Japan, I dived in and bought this 90-gram (3.2 oz.) bag for $1.50 (118 yen). I took the presence of such things for granted, but somehow was not punished for my lack of regard. I've mentioned before that the Japanese call a wide variety of rice-based crispy snacks "sembei". While western folks who are somewhat familiar think of them as savory rice crackers, largely flavored with soy sauce or sesame, there are a number of sweet versions and this is one of them. They're more like a cookie than a cracker, except that they lack the textural elements of a cookie. Each little bit of sembei is coated with a hard frosting and they smell very strange, almost like some odd chemical is at work. The flavor is very strongly infused with ginger and quite sweet. This is no surprise as the ingredients include sugar, glucose, fructose, and dextrin. All those sweeteners are held together with a little wheat flour, eggs, and margarine and flavored with ginger. Health food, this is certainly not. In terms of the sugar, this is probably going to be far too much for people who aren't fans of especially sweet food. However, if you like candied ginger, this is like a crispy version of it. Fortunately for me, I am a fan of said version of ginger, but there are limits to how much one can eat at once before the sweetness and intense ginger start to overwhelm. You can look at that as built-in portion control, or as an impediment to finishing the bag before it goes stale. The latter did occur in my case, but I wasn't eating small amounts daily so it would be possible to have a few a day and still have the last one be crispy. I loved these, but I recognize that they may be far too strong and sweet for a lot of people. I can't rate it for others, but I wouldn't hesitate to buy this again. That being said, I wouldn't want to have it around all of the time or eat it day in and day out. There's really only so much super sweet ginger that I need in my life, but this has an excellent flavor and great crispy texture. 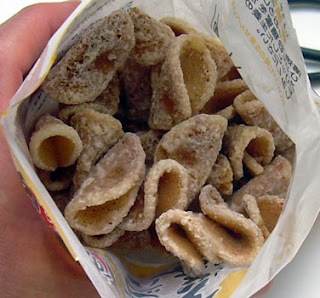 Candied ginger fans should definitely seek it out. Others will want to give it a pass. These are made by a company called Nanao, but it's my guess that any ginger sembei that resembles this will be much the same. It's one of those companies which is small and has little presence in the market in terms of name recognition. You can buy this particular brand online at Pacific Mercantile Company, or the Marukai e-store, though I got mine at the Daiso Japan shop in Mountain View, CA. The Simpsons once did an episode about Springfield's lemon tree being stolen by some of the residents of Shelbyville. Jebediah Springfiled and his followers planted a lemon tree because it was the sweetest fruit available at the time. This show was about small town rivalry, something which I grew up with and am truly familiar with. When your world is small, you tend to attach significance to stupid things because you're not worldly enough to realize their insignificance. At the end of the episode, the Springfield mob steals back their lemon tree and they all enjoy a glass of lemonade as the Shelbyville denizens have a glass of turnip juice, because that was likely the only thing they had available at the time. I never saw halva for sale when I was living in Japan, nor did I see turron. In fact, one of the first things I picked up at an American convenience store was a pistachio halva bar because I had been reading about it and wanted to try it. It was sticky, hard, and slightly bitter and I was not a fan. However, when my sister-in-law asked if I wanted anything from Spain when she visited there, I checked out traditional Spanish sweets and came across turron. She brought me back this box. There are many types of turron and you can find them in various ethnic markets as well as available online. One type is like a nut brittle. This one is like an enormous wet slab of chalky nut butter. When you open the box, there's a sealed packet with lots of what looks like unpleasant meat juices swimming between the clear plastic and shiny plastic. It looks insanely nasty. Undoubtedly, turron de jijona is hard to handle because it is slightly soft, tends to break off in soggy clumps, and has a lot of wetness around it. That being said, it's worth the mess. It's a rich, sweet mass of almond butter mixed with honey. Turron de jijona is a form of nougat, so it is made with egg whites, sometimes raw ones, but I'm sure any packaged stuff that you buy is safe. I've had pistachio halva before and this was much, much better both in terms of texture and flavor. 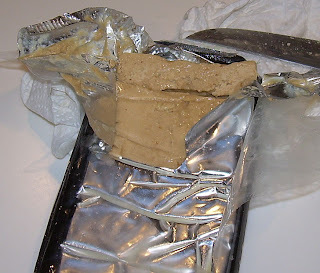 The halva I bought (from a convenience store in a package like a candy bar) was bitter and hard, like taffy. This was soft, melt in your mouth fatty, sweet but not too sweet, rich, almond, nougat and honey delight. There really aren't enough positive adjectives for how much I liked this. In Japan, most of the nut-based sweets were made with peanuts or sesame, because that must be what they have on hand. In Spain, many things contain almonds. Fortunately, neither one of these countries ended up with "a cool glass of turnip juice". They both had lemons and made lemonade in their food cultures. *I made most of this up. I don't think thinking caps existed back then. 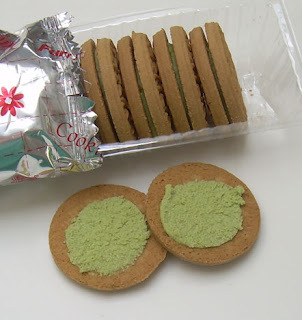 One of my favorite snacks in Japan was chinsukou cookies. For quite some time, they tended to be the sort of thing that you were given as a gift rather than found in shops and bought for yourself. However, during the last several years that I was in Japan, they became increasingly easier to find. I'm sure that a big part of this was that Okinawan cuisine, which has always been recognized as being specialized, was becoming more and more popular all over Japan. When I had left, I believe it's popularity had not yet peaked. If you don't want to go back and read the linked review, I'll mention that these are a type of sugar cookie made with lard which resemble shortbread crossed with a classic Christmas sugar cookie. While I first experienced these as a souvenir from a student who visited Okinawa, later, I found small bags of them for sale in Natural Lawson's convenience stores. Later, I found this big family pack on offer at a discount shop above a local supermarket. You know something has gone mainstream when it is sold in bulk at no-name shops. The flavors for sale here are plain, black (brown) sugar, and sweet potato. I tried many flavors (chocolate, chocolate chip, salty plain, pineapple, sweet potato, pumpkin and more!) of these when I was in Japan, and always like the plain ones best. The others were good, but there was something about the pure and simple taste of the plain one that worked. If you're in Japan or an import store, you don't have to read Japanese to know these. They are always in this shape and size so they can be easily recognized. Sometimes they are sold individually in large bins filled with tiny cookies at Okinawan food fairs and you can cherry pick a variety of flavors for about 20 yen (about 24 cents) per cookie. Though they aren't the healthiest treat in the world (hello, saturated animal fats), an occasional one in the interests of sampling regional cuisine isn't likely to harden your arteries into rocks. One of the delights of being back home is finding products that I saw in Japan and then buying them in their American incarnation to see if they are the same thing. It's a process not unlike that which is done by the blog "Second Rate Snacks, except that, well, I'm comparing products made by the same company under a similar name for the domestic market and export. Come to think of it, that makes it very much not like Second Rate Snacks, which compares two versions of a similar product from different companies, at all. 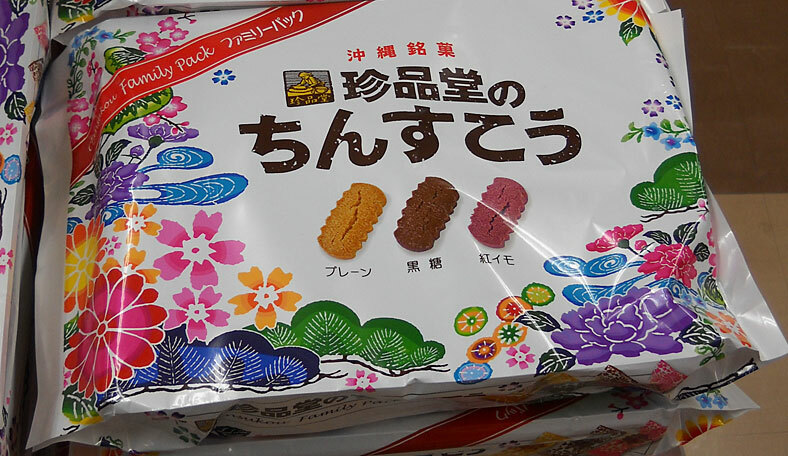 At any rate, the version of this cookie and chocolate combination is sold in Japan under the name Takenoko no Sato, which means something like "bamboo shoot village". The American naming seems to be especially designed to keep enough of a Japanese feel (by using "choco" instead of "chocolate") without causing people to scratch their heads or fear that they might have accidentally purchased panda bear treats instead of people food. 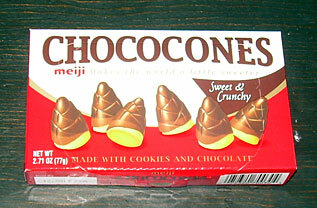 Though the name focuses on the basic cone-like shape, the cookies themselves are exactly the same shiny little domes of cookie-ness that are sold in Japan. I checked the box carefully to see if these were made in Japan or if they were one of those things which was produced in a country with cheaper label and then named as a "product of Japan". To anyone other than me, this little bit of information does not matter, but I do want to know if I'm essentially eating what the Japanese eat or if it is some version that has had the recipe altered to suit another set of taste buds. I don't know the answer because the box didn't say where it was made, only that it is a "product of Japan" distributed by an American biscuit maker. I've had takenoko no sato before and reviewed a strawberry version previously. My memory is that these are pretty good, but nothing earth-shattering. My memory is actually pretty good in this regard. The chocolate on the outside is pleasantly sweet with slight bittersweet notes. If you eat too many at once, they can become just a bit cloying, but you're okay if you limit the serving size. The inner biscuit has a nice texture and resembles a coarse shortbread or thick butter cookie. The cookie is not particularly flavorful, but that really isn't an issue as the chocolate is doing the work here. Mainly, the biscuit portion is adding texture and crunch. These are nice enough as a little sweet something to keep in your desk for a bite or two of cookie. 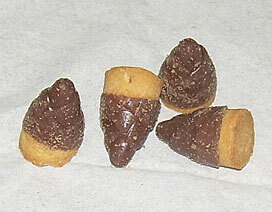 Each cone, which is about the size of a thumbnail, is about 13 calories, but most people are going to eat a lot at once. A serving size is given as 12 pieces and there are about 3 servings in the box. I bought these at Cost Plus for about $2, but later found them at Daiso Japan for $1.50. In Japan, I believe these sold for about 100 yen (about $1.20), sometimes more depending on where you are buying them. You can buy the original version as an import from Amazonfor a staggeringly higher price ($4.80) and get the authentic packaging, but these really are the same thing as you'd get in Japan and there's no reason to pay more. I'm a bit torn on how to rate these. They are pretty tasty, but not exactly the sort of thing I'd go out of my way to buy or add into my regular rotation of snacks. It's not impossible that I'd buy them again out of nostalgia, but I'm unlikely to simply say that I "have to" have them again because of their deliciousness. I figure that is the very definition of "indifference" so there's my rating, but it doesn't mean they're not tasty. They are, just not special. I think they may be a more interesting treat for less jaded palates than mine as they are a solid reflection of Japanese consumer cookies and chocolate which are less sweet and have better flavor depth than some pedestrian snacks of a similar caliber in the U.S., but I can't really say I'm much above indifferent about them. 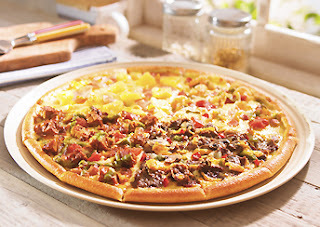 Images from Domino's Japan site. People often scoff at what passes for foreign cuisine in American restaurants. They deride Americans for sullying the food purity of other cultures to suit their pedestrian tastes. What they don't talk about, and yet remains a fact, is that all other cultures do exactly the same thing. I've heard that there is an "American" pizza sold in Italy which has French fries piled on it as a topping. That's okay because I've seen that same pizza in Japan that was also billed as "American pizza". Though it is possible that some place in the U.S. does offer such a pie, I have never seen it here. French fries are from Belgium. Pizza is Italian. Putting French fries on pizza is not something Americans do. I'm not sure how the components of this foodie equation add up to anything "American". 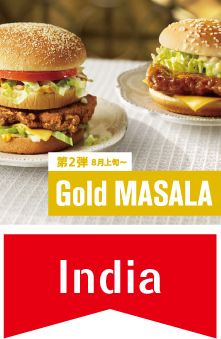 While I am bemused at the foods that get called "American" in Japan, I'm not really bothered. Well, that's not exactly true. I only became bothered when students would insist that I ate things I never ate because they ordered things at restaurants which ostensibly originated in my home culture. I don't like being told what I eat by people who have never watched me consume a morsel, especially when they're telling me I eat a lot of trash that I don't eat. If we're going to ascribe junk food to my diet, then at least let it be the nutritionally deficient morsels that I'm actually consuming and not the slapdash efforts of restaurants and food manufacturers which they are offering as "American" food to non-Americans. The thing that never bothers me is the idea of authenticity. I don't care if other cultures take some original American food and give it a native twist. In fact, I say, more power to you because it's interesting to see what they do to suit their palates. When I discovered that Domino's Pizza in Japan was offering up a "Great American" pizza, I prepared to exercise my wit on just how outlandish the toppings were going to be. I'm afraid that they disappointed me. The pizza is what they call a "quattro" in Japan, which means that it has 4 different sets of toppings. In this case, each portion is supposed to represent a different area in the U.S., Hawaii, Philadelphia, Texas, and California. As a native Pennsylvanian, let me say that I am bemused by the fact that only one region is known by a city name rather than the state name. That's because Japanese people are familiar with the city of Philadelphia, but not the state of Pennsylvania. As a little game, my readers may want to ask themselves what sort of toppings they'd guess represent each of these areas. For instance, you know that pineapple will be on anything which calls itself Hawaiian. The topping for that section is simply called "tropical", but it is pretty much ham and pineapple. Philadelphia is "Philly cheese steak". California is a little harder to guess, except for the fact that we know anything "California" has avocado and this does (along with shrimp, which doesn't strike me as very Californian). Of course, if it were truly authentic, it should include some weed. Texas is represented by chipotle chicken. All in all, they let me down because there is nothing there for me to point and laugh at as a funky distortion of American food culture. Beyond this American offering, they are also selling "black chili", which oddly is not black at all. 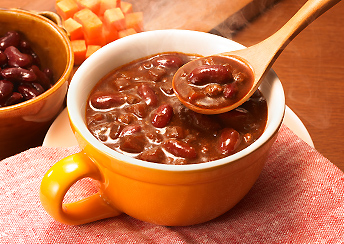 It looks like pretty normal red/brown chili. The lesson to take away from this is one that I learned a long time ago and that is not everything in Japan is weird. We tend to see the funky stuff because it is unusual and much of the time, what you're not seeing is run of the mill. However, if it makes you feel any better, they still put corn and mayonnaise on their pizza. The original quattro pizza includes not only mayo, but broccoli as well. 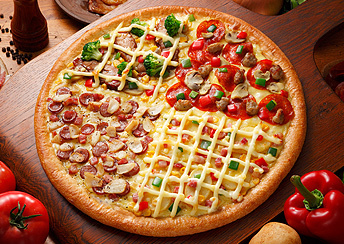 And the concept of a quattro, which divides a smallish pizza (even the large pizzas are small in Japan) into 4 sections because Japanese people value novelty, is about as Japanese as it gets. Click to see a larger, more readable version. The name of this energy bar by Asahi caught my eye because it sounds like a noise someone would make when they sneezed, or possibly something you say after someone sneezes (gesundheit). We often say that a sneeze sounds like "a-choo" and the Japanese say that it sounds like "hakushon" (hah-koo-show-n), but neither of these really seems right to me. 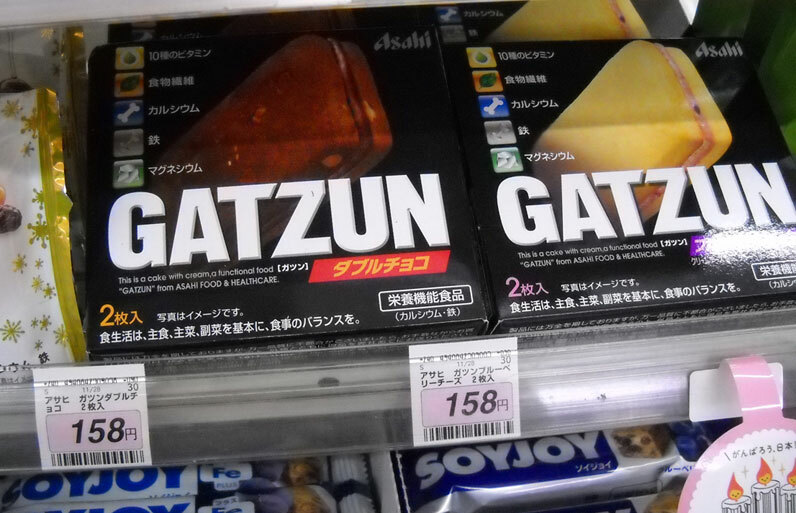 If I could start my own little trend, I'd encourage people to start saying that it sounds like "gatzun", or "jabarkas", but the latter is a whole other story entirely. Returning to the matter at hand, these energy bars are fortified with all sorts of vitamins and minerals so that you don't have to eat actual food to get nutrition. The text under the name says, "this is a cake with cream, a functional food." I certainly wouldn't want to purchase a non-functioning food-stuff. I mentioned in a previous post that one of the nice things about buying Japanese products in America is that they save me from having to translate the ingredients. While I can read a lot of the characters representing common ingredients now without trouble, there are, at times, unusual things which I need to look up and a bit of time is now saved. That being said, there is a new problem associated with the translations. The English labels are slapped over the information in Japanese such that I have to try and scrape them off to get to the Japanese when I want it. In this case, I wanted to see the name of the company that made the product (not the importer, which was all that was listed in English). I spent five minutes carefully scraping at the residue hiding the information I wanted to extract. Of course, I'm pretty sure nobody but me cares who makes the food I review, but now that I've gone to all this trouble, I'm going to talk about it. 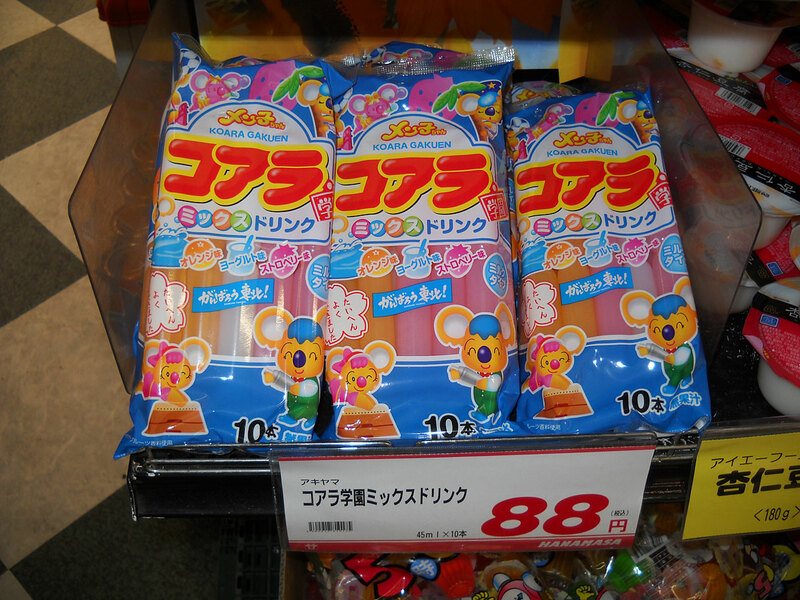 These are made by a company called Taiko Confectionary and it's a company I've never sampled a product from before. They're one of those businesses that is so small that they have little web presence beyond a couple of basic reference pages with addresses and phone numbers and a map. That means, unfortunately, that this product may be hard to find outside of where I located it in the U.S. (Daiso Japan) or in Japan. These are called "sweet potato cookies", but they're really not a cookie. 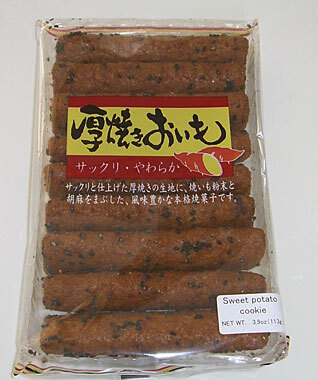 They're much more akin to the "bo" or "stick" snacks that are sold to children in Japan. That being said, the ingredients list is certainly in the realm of what suits a cookie. The first ingredient is sugar, followed by wheat flour, bread crumbs, corn grits, starch syrup, vegetable oil, sesame seeds, and only then sweet potato. So, there really isn't much sweet potato in these. These smell very strongly of black sesame seeds. Each tube is hollow and super crunchy. The hole in the center makes them much easier to eat, though, if you are not careful, it's easy to bite into it the wrong way and send a shower of crumbs into your lap. They are very sweet and those who are sensitive to especially sugary treats may find them overwhelming. Despite being quite sweet, the intense flavor of the black sesame and the somewhat more delicate flavor of sweet potato come through well. I often complain about "too sweet" sweets and this definitely has that potential, but it worked for me on multiple levels. First of all, I love the crunchy, crispy texture and find biting into one of these very satisfying. Also, there is a sort of shellacking on the outside of them which I'm sure is part of the heavy sugar concentration that works both visually and for the texture. I think that, if these weren't so sweet, there might be a danger of the flavor being flat. Sugar, like salt, is a potent flavor enhancer and works well when optimally applied. I think this is pretty nicely balanced, but it may be too much for some people with different tastes. Despite all of the sugar, they are only 60 calories each for a cookie as long as the span of my hand up to my longest finger (about 6 inches/15 cm.). You get a larger size I guess because they are hollow, but it does feel like a pretty substantial treat and pairs well with tea or coffee. I paid $1.50 (120 yen) for these and will absolutely stock up on them again when I find myself at the Daiso Japan. I loved them. They may be pure junk, but they are tasty as all get out. After living on the shores of America for several months, I must say that I flirted with the notion of changing this blog to "international snack reviews". I pondered that possibility for more than one reason. 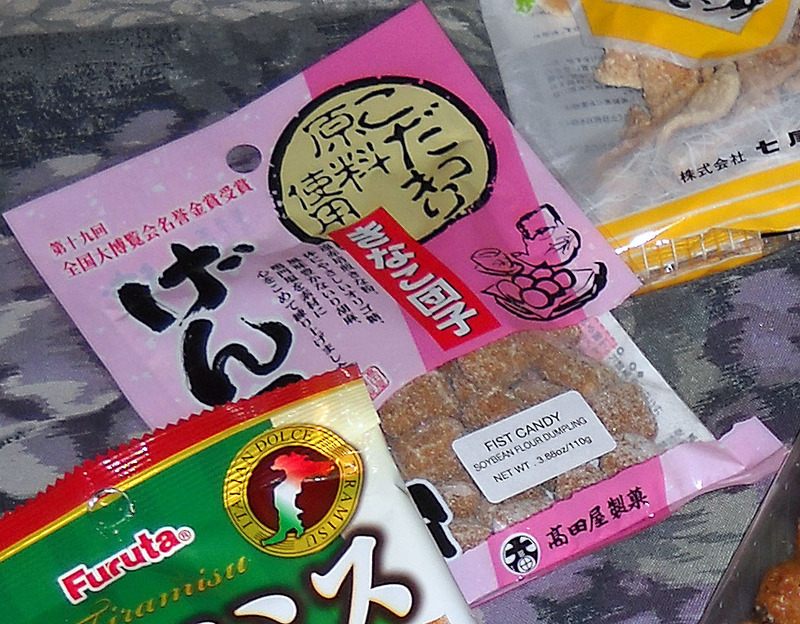 First of all, I wasn't sure of my ability to consistently access Japanese snacks and I was sure of my ability to get my hands on a plethora of food from other countries (especially Mexico at this point). Also, I want to branch out and try different things, especially after quite a few years of focusing on all things Japanese. 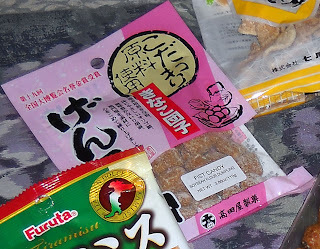 However, my heart is still very much with Japan and Japanese snacks so I hope that my readers will tolerate my detours to other types of food on occasion while still accepting this blog as "Japanese Snack Reviews". All of that being said, it was definitely experiences in Japan that brought me to this particular item. Well, there is that and the fact that the product's name smacks of being a euphemism for a harlot's hooters. I was at a convenience store on San Juan Island and I saw something called "conchas" being sold there which looked a great deal like Japanese melon pan. Since a lot of Japanese baking culture has been influenced by Portugal (and other European countries), I wondered if melon pan was a riff on conchas. I didn't buy the pink-topped monstrosity I saw there, but I found a less scary version with a funnier name later. For those who don't know, "melon pan" does not taste like melon, but rather is designed to resemble it. It is a bread-like bun covered with a cookie-like outer layer that is poured over the bread dough. The top is then scored to make it look like the rind of a melon. Conchas, similarly, is a bun with a different sort of dough that is scored to look like a conch shell. 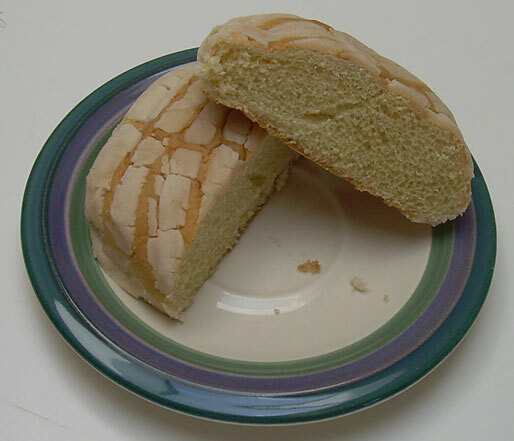 I've read several recipes for conchas and they seem to be very much the same except that there is division on the side of the Mexican sweet bread about whether or not the shell should be soft or crispy. Some insist it should be soft and others say crispy. Note that, in Japan, melon pan comes with both soft and crispy tops. I bought this packaged conchas with the slutty maker name at Target, but the Bimbo brand is available at many different places in California as well as in markets in Spain. My sister-in-law, rather coincidentally, took a picture of Bimbo brand bread in Madrid. It cost $1.38 (111 yen) for two buns. Each bun is 240 calories and a decent size for breakfast or a snack. The second ingredient is egg and the first is flour. The third is high fructose corn syrup so beware those who fear it. Packaged bread products are never the greatest, especially those that are designed for somewhat long shelf life, but this really wasn't too bad. The coating on top is a little moist and slightly sweet with a nice hint of cinnamon. This may help keep the bread from drying out too much. It has an interesting "doughy" flavor which resembles ever so slightly under-cooked bread. It's an interesting and certainly not unpleasant quality. Conchas from a Mexican bakery, or melon pan. Po-tay-to, po-tah-to. In terms of how closely this resembles Japanese melon pan, it's actually a very similar concept with a different execution. Mainly, the flavor and consistency of the topping is different. The underlying bread is almost dead the same. 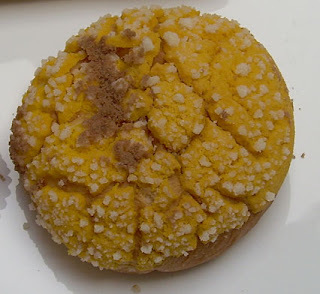 That being said, I went to a Mexican bakery and bought a conchas there and it was dead-on the same as melon pan with a crispy sugar-crusted top. It wasn't exactly the same as a Japanese melon pan, but it was so close as to not be terribly different. I'm sure that conchas is the well from which melon pan sprung. 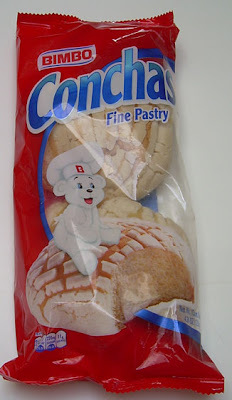 As for the Bimbo brand Conchas, it's an okay packaged pastry, but hardly the "fine pastry" that it claims to be. 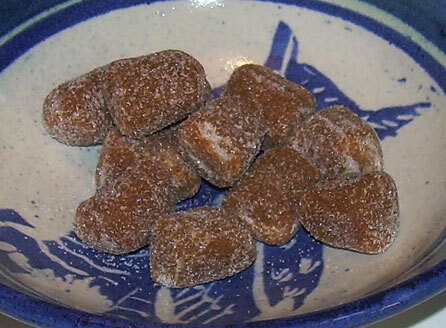 If I were looking for a relatively mild sweet to have with coffee and had nothing more attractive, and by that I mean homemade or freshly baked, I would consider it. Chances are, however, that I wouldn't buy this again. It's not that it's really all that bad. It simply isn't all that good and I'm surrounded by more attractive similarly priced options. One of my friends recently told me that he revisited his childhood by buying Otter Pops. Though he is about 17 years younger than me, those were a part of my childhood too. For those whose younger years were not graced, or disgraced depending on you viewpoint, with the dubious joys of Otter Pops, I'll say that they are plastic tubes of sugary liquid that you toss in the freezer for a cheap frozen treat. Parents can buy them by the 100 and give their kids something cold to shut them up in the summer. When I saw these Koala School drink tubes, it reminded me a lot of Otter pops, though the cartoon animals and plastic tubes really are pretty much where the comparison ends. As far as I could tell, these are not meant to be frozen and the flavors include orange, yogurt, and strawberry (whereas Otter Pops have 8 flavors). 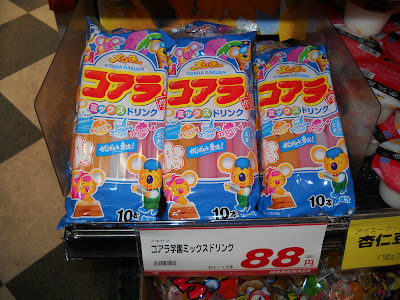 Even though these are really cheap, 88 yen/$1.10, they aren't as cheap as Otter Pops. I did like how these seem to be designed for kids, but show a bartender shaking a shaker on the front. Shortly before I returned to the United States, the Oreo cookie, perhaps the world's most famous sandwich cookie, turned 100 years old. The concept of two cookies with some sort of sweet filling between them likely pre-dates the venerable Oreo by centuries as it seems natural for someone to see a couple of plain cookies and think about how it might be interesting to put some honey, jam, cream, butter, or other sweet filling between them. However, the processed packaged sort of sandwich cookie is a product of our modern age and bless the person who invented them. I haven't found even a bad sandwich cookie that I hated, though I've certainly had a few that I didn't exactly love. As I've mentioned before, having grown up poor, I never ate Oreos. We had store brand cookies. You know, the sort that you used to buy in industrial sized packages for about a dollar. Each plastic package had enough empty calories to keep you energized but malnourished for weeks. Of course, my mother didn't buy those cookies all that often because, you know, poor folks back in my day didn't do that too often. We were too busy poaching deer so we'd have meat for awhile or stealing a Christmas tree from the distant areas of some poor sap's farm. At any rate, I love sandwich cookies, but I rarely buy packages of them for one big reason. They are almost always calorie-dense. My husband and I bought some peanut butter Oreos when we were still on the San Juan islands because Japan doesn't sell peanut butter and chocolate sweets and the idea was so marvelously American that we had to indulge. Unfortunately, the package, which was a "regular" one, took us a little over a month to consume. Both of us are still a little taken aback by the way in which it's hard to buy very small portions outside of convenience stores and their supposed "snack packs". When I checked the nutrition information, I noted that each peanut butter Oreo was a whopping 71 calories. For that price, I could enjoy three vanilla meringue cookies or an entire piece of most types of fruit. Still, sometimes, you have to spoil yourself (as Ned Flanders says), and you have a craving for a sandwich cookie with its crispy outer planks and creamy inner filling. And sometimes, you've lived in Japan for a long time and are "homesick" for its flavors and decide that green tea sounds pretty damn good right now. Such was the case for me when I found these at the Daiso Japan for a $1.50 (120 yen). The box contains 10 somewhat largish (a bit bigger than an Oreo) sandwich cookies and they come with the bargain calorie count of 51 calories each. They're also fortified with Calcium and that may provide you with some comfort if you're the sort of person who feels the need to nutritionally justify your junk food consumption (I'm not). Most people feel that the sandwich cookie succeeds or fails on the cream filling, but I'm actually more about the quality of the outer cookies. Sure, the cream is important, but if the cookie is bad, that makes the filling irrelevant. It's like a good cup of coffee. It doesn't matter how great the cream you use is. If the brew is not good, the experience is ruined. Fortunately, the cookie exterior on this is very nice. It has a nice snap with the right amount of fat-induced flakiness. It either has a good carmelized sugar flavor or is made with brown sugar because it definitely has that sort of edge to it. The ingredients do not specify anything other than "sugar". 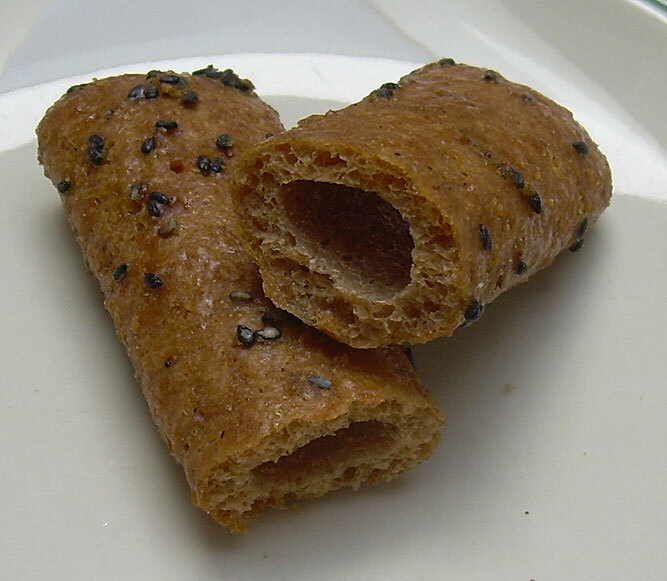 It probably helps that they are made, at least in part, with whole wheat flour and their is a small hint of earthiness rather than the flat blandness of white flour. The filling is a bit scarce, but that's okay because it carries just the right balance of green tea bitterness with some sugary sweetness. The only thing which could be better is some more textural decadence with more fatty interior, but I'm not complaining. These are solid cookies on every front, though they absolutely don't carry the sort of over-the-top sweetness that Oreo cookies do. The best thing about that is that there is nice flavor depth. You can taste the cookie's quality's as well as the filling. I'd definitely buy these again. Though I can't say I'd want to keep them on hand at all times, I'm not sure I can say that of most of the things I enjoy. If you're a green tea fan, they're absolutely worth a visit. Note: If you can't access these any other way, I found them online at a place called eFood Depot for $3.95 a box. They're a little expensive there, but for those determined to try them (especially serious green tea lovers), they're likely worth the price.